This morning we awoke to strong winds just as we had hoped. The cabins are located within a circular clearing surrounded by tall spruces on most sides, making it difficult to judge the wind direction. This morning, however, it appeared to have a north component. I was the first one out to the coast and was greeted with strong winds out of the due north. Perfect! Immediately after sitting down I began scanning the horizon as the tide came in. Immediately I got on asmall gull with a strong black and white wing pattern that I suspected was a kittiwake. Eventually as it followed the bird along the tide line it became close enough to confirm the ID. Kory was arriving just in time, and he got on the bird as well when it was straight out from us - not a bad start to the day! While Black-legged Kittiwake is on the review list for the Hudson Bay lowlands it appears to be a somewhat regular autumn migrant on north winds. Another "write-up bird" arrived soon after Alan showed up - he spotted it coming in from the west very close along the tideline. . A dark jaeger, which eventually came close enough to identify as a Pomarine. Another semi-regular fall migrant, but exciting none-the-less! The north winds were causing other birds to migrate - namely, Hudsonian Godwits. This large,striking species often forms large groups of hundreds of birds which are often seen migrating well offshore and at quite a height (for shorebirds). This flock was close (and low) enough for distant photos. 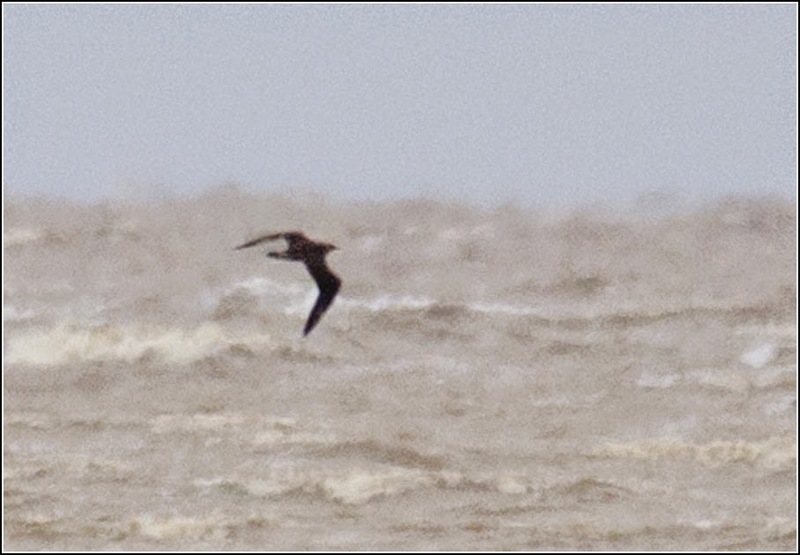 The best bird of the day flew by at 10:30 AM; about half an hour after the Pomarine Jaeger. As I was scanning to the left a large white and black bird suddenly appeared in my scope view. It only took a second to realize I was staring at an adult gannet, our second in two days. It, too lumbered on to the east and out of sight after a few minutes. While yesterday's bird might have been a near adult (it showed some uneven plumage near its wing tips) this one appeared to be an adult, with a sharp contrast between the black distal 1/3 and white proximal 2/3 of the wing. 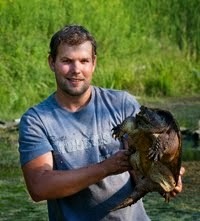 It also had some brownish coloration around the head. The winds continued out of the north and our first Brants, Common Goldeneyes, Red-breasted Mergansers and scoters (all three species) for the trip were seen. Overall, however, duck numbers were relatively low for the seemingly great conditions as Northern Pintail was our most abundant species (we saw a few flocks totaling 80). Two Parasitic Jaegers flew by - a young bird at 11:40 AM and an adult shortly after 1:00 PM. Luckily I happened to be ready for my camera and after firing away a few dozen photos of the jaeger, a few turned out. Kind of. You can tell it is a jaeger, right? 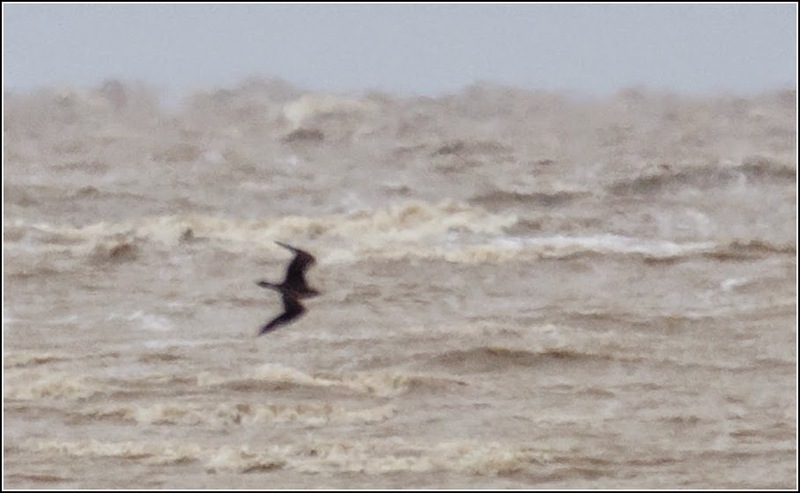 Throughout the afternoon the waterbird flight slowed down and the tide receded. Some Rough-legged Hawks occasionally passed by after crossing the bay from somewhere in Quebec. 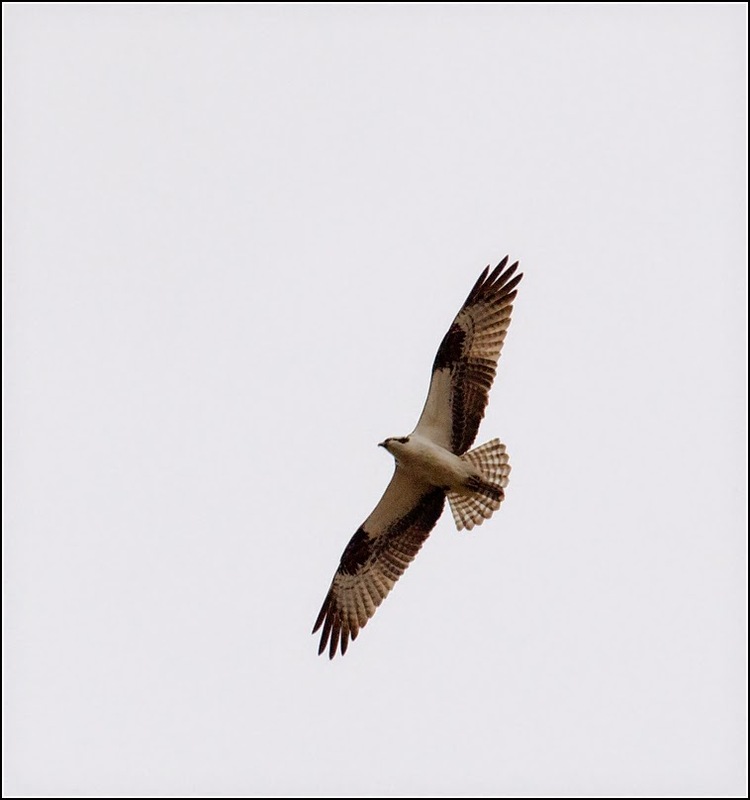 A surprise was a late Osprey which passed directly overhead for Jeremy, Kory and I. It circled several times allowing us a chance at photos. 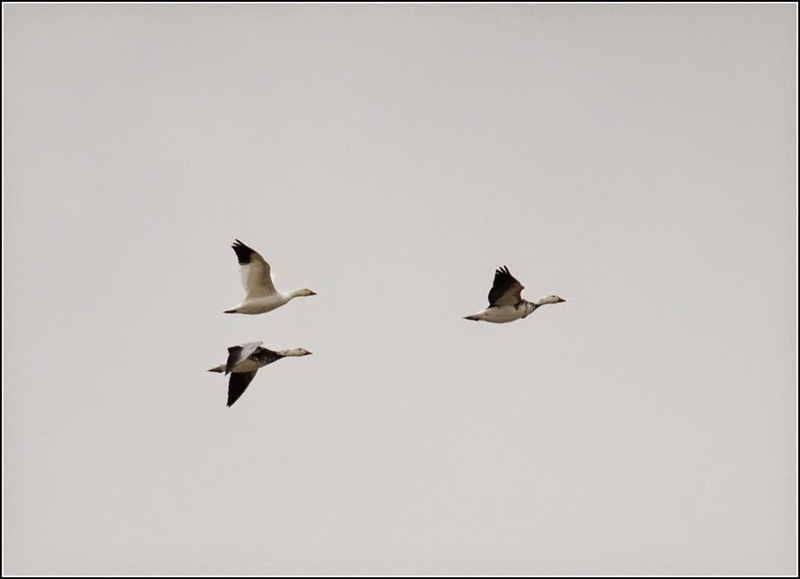 A few small groups of Snow Geese cruised by as well. Because of the north winds we did not spend much time on the hunt for songbirds today and as a result our species total was only 48. However we had observed several quality birds and the north winds had not failed us. Unfortunately it would be our only period of sustained north winds all trip! We still had 11 full days ahead of us however and were bound to see a few more good birds!